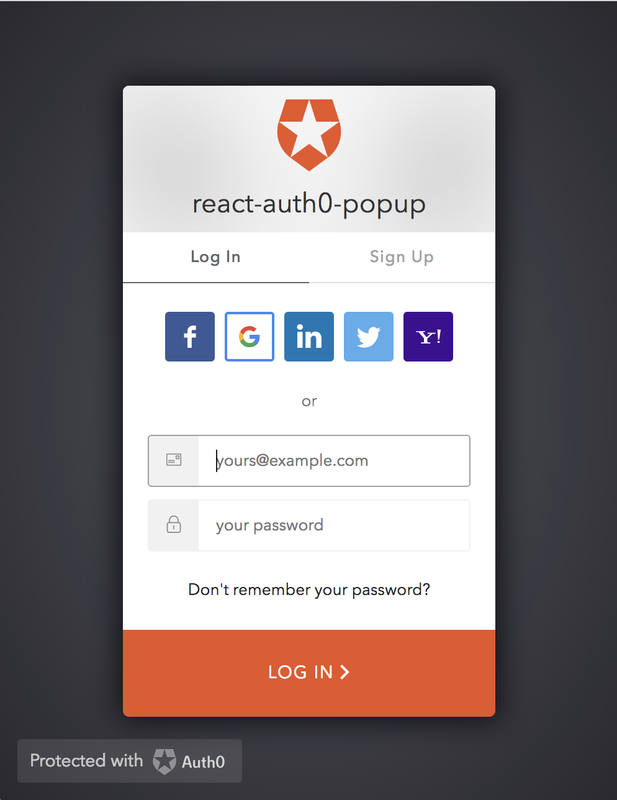 TL;DR: In this post, we are going to build a React application with Auth0 authentication using the popup feature. We will cover some of React’s newest features, starting our app with create-react-app. We will be using React Hooks to write components without using any classes. We will also be using Auth0’s Popup authentication flow and we will be covering how the popup mode might be a good option for your project. You can find the GitHub repo here. React Hooks are new with the current version being, React 16.8. This allows for function components to have a state. No longer do you need a class component to have a state. Let’s learn more about Hooks. "React Hooks are new with the current version being, React 16.8. This allows for function components to have a state." Hooks are one of the latest additions to React, giving you the power to avoid having to write a class component to use state. Function components are now more powerful and that calls for less code. Yay! Use hooks to "hook" state into a function component to make it much more versatile. We will be writing our frontend components using Hooks. As we go over the code in the application, we will discuss how to implement this new React feature. Auth0 offers a variety of different methods for users to log in. In today’s example, we are going to be using the popup method. The user will be able to click on a button to enable the popup to activate, the user will log in, and then the popup will disappear after they have been authenticated. A lot of users will have popups disabled on their browser, so when it’s not necessary to use, we recommend not resorting to the popup method. But it is always good to know how it works! Today we are going to be building a single-page application with a back-end API. The initial view will be a list of TV shows with a Log In button. The user will be able to hit the Log In button and the Auth0 log-in popup will appear. After successfully logging in, the popup will disappear and the view will change to a list of movies and TV shows. The view of movies and TV shows will be protected so it will not show up unless the user is authenticated properly. At the bottom of those lists, there will be a Log Out button which will take them to the unprotected view of just TV shows. It should then navigate automatically to localhost:3000 in the browser. We should see the React logo! "Using create-react-app and npx together to scaffold React apps is awesome!" Today we are going to be using Auth0 for authentication in our application. To create a new account, visit Auth0's sign up page. To log-in to your exsisting account, visit Auth0's home page. Once we have logged in, click on the big button in the upper right-hand corner that says + New Application. It will then bring up a modal and we will give our new application a name, "react-auth0-popup". Click on Single Page Web App and then click on Create. We will then want to click on the React option for the "technology" we will be using for our application. We will be going over how to integrate Auth0 into our project. There is a quick-start method, but we will be going over the Auth0 implementation without using the quick-start. We are next going to set up our API for our project. It will be the "audience" aspect of our app. Learn more about the audience parameter here. Give it a name and an identifier and then click on "Create". An example for a name could be "tvshows-movie-api" and an example for an identifier could be "https://tvmoviesapi". Remember, the identifier cannot be modified once created. From there, we will click on "Settings" tab and we will see the identifier and name spots filled in with that information we inputted. We will be using the identifier in a little bit so keep that handy for now. // be sure to delete the commented out file path name for our json files if copying and pasting. Note: These credentials come from our application within our Auth0 dashboard, not the API application settings. Once we have this set up, be sure to head over to our .gitignore file and put this file path in there. We will want this file ignored so when it is pushed to GitHub, others cannot get our Auth0 information. Each of our files filled with TV Show data and Movie data will need to be assigned a route. In the api folder, we will want to make another file, we will name that one routes.js. We are going to need to add in a couple of dependencies that will be used within this file. By adding in our route paths, we are going to be able to test our API data. 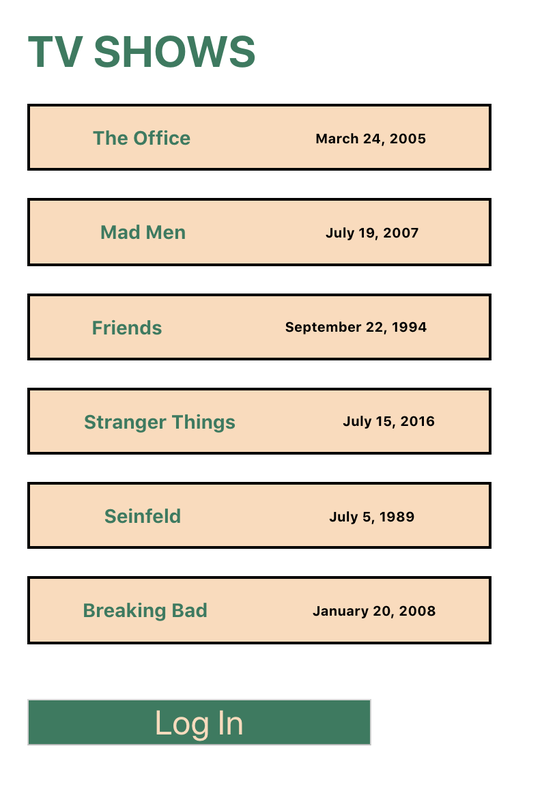 Using a product like Postman, we will be able to test whether or not http://locahost:3000/api/ sends back "API is working" or if http://localhost:3000/api/data/tvshows returns a list of TV Shows from our API data. Note: /api/data/movies will only show if the middleware, authCheck, is ran without any problems. Now that we have our API ready, we will need to make sure our server is up and running. In the root of the project, create a new folder titled, server. Within that folder, create a file called server.js. In here we are going to need a couple dependencies so dive into that file and let’s get working on it. We are going to see those added into our project. Once those are done installing, let’s add them into our server file so that we are able to use them. We will see that it is "Listening on port 3005". We now have our server running! Now that we have our server set up and our API data ready for us, let’s build the frontend so that we are able to view this information on a web browser. Throughout our frontend app, we are going to be using our Auth0 credentials. For convenience, we'll hold those credentials in a file so that we can easily import them in components that need them. For security, however, we'll include that file in our .gitignore file so that it doesn't get committed to GitHub. // we will go over this redirect soon. With our Auth0 credentials, fill that information in and then stick that file path in the .gitignore file. Open up the .gitignore file, and insert this line config.js. That will do the trick! To learn more about ignoring files, visit this website. Let's go to our settings tabs under the application we made earlier, we will see fields for our "Allowed Callbacks URL" and "Allowed Logout URL". There we will put in the URL’s that we put in our auth/config.js file. This is not from the API settings, but the application settings. The popup can be tricky, a lot of people block popups from showing up in their browser. At Auth0, we do not recommend using the popup method because of them being blocked, but it is always good to know how to do it. When using popup, we will need a separate file that handles the closing of the popup. Within our public folder, create another folder and we’ll name it, close-popup. In there, create a file named, index.html. This is where we are going to "redirect" after the authentication is verified. We want the close-popup file to run and for that popup to disappear and take the user back to what they were doing. We will want to put in our Auth0 application credentials into the two lines indicating domain and clientID. Remember, our domain should be something like yourname.auth0.com and the clientID will be a long string of characters. After putting this file in the .gitignore file, we will be able to have a popup that will close after the log-in process is complete. We are putting it in the .gitignore because you will see that our Auth0 credentials (domain, clientID) are stated within this file. Notice in the responseType we have id_token token. We are going to be using both the id token and the access token for this project. And in the scope, we will have the openid, profile and email coming through. We are going to be using different variables throughout our functions within our service.js file. Let’s get those set and declared. By setting things like our idToken or idTokenPayload to null, we are going to allow ourselves to give those values when necessary. We will also want to save that accessToken so that later on we can save it to a header. At Auth0, we do not recommend saving user information to localStorage but we will save the authFlag to localStorage. By setting that to true, we are able to save this particular sessions status. We are also going to build our localLogout function here. This will be taking the information we want to be cleared and clearing it for us, setting things back to null. Next, we are going to create a function that will hold on to the value of our accessToken so we can use it later on. When our user clicks on our Log In button or whichever method we choose, we want our login function to fire off and give them a smooth experience. Our login function will be using the auth0 variable we set earlier in the file and use the popup capability. We are going to be able to activate the cool feature of popup. We are going to check for two things: Authenticated or Not. If their user information is passed through, then this function will grant us an accessToken that we will be using. If not, an error will happen and localLogout() will take care of things from there. We will also be adding in isAuthenticated() to set the localStorage authFlag to "true". When our user clicks on Log Out, let’s clear out the information we just saved and used for authentication. We will also be calling localLogout and get that running. We will also take them to the logoutUrl that we have set in our config file. We are going to want to use this information freely throughout our application, so we will set auth to new Auth(). By doing this, we are going to be able to use these functions in parent and child components. We are creating an instance of Auth() that will be hosted in this module and can be used throughout the application by anything that imports it. Once that is declared, we can export this file. We are good to go! We are going to be using three components for our application. One parent and two children components. The App.js component is already there and created for us. When we ran create-react-app, it built the initial view for us there. We can go into that file and clear it out, we’ll be changing a bunch of it. We have not created two of those imports yet (those are going to be our child components) and we also have our auth/service.js file coming in as well. Our App component will take care of the Log In and Log Out buttons and which component we want being viewed. Those two functions will toggle the state for us. When loggedIn() is being called, we want the loggedIn state to be changed to true. With the opposite happening for loggedOut(). We will see that code soon. By using the ES6 Ternary feature, we are going to toggle our Log In and Log Out buttons and also which component to show on the page. To learn more about ES6 Ternary’s, visit this page. We are going to have two child components, TvShows.js and Movies.js. In both of these, we are going to be using React Hooks. The component itself will look familiar but some of the functionality will be executed differently. We are using React Hooks in these files. We are going to be importing React features like, useState and useEffect. Imagine useState is like setState but now it can be used in a functional component; no need to write a class! And useEffect can be used in place of lifecycle methods like componentWillMount. The variable shows is similar to this.state. The second, setShows is similar to this.setState. That third part, useState() is going to be our initial state value. Next, we are going to use useEffect instead of componentDidMount. By using fetch, let’s call our API's data and receive the response. This information is allowable whether or not the user is authenticated, this information is not "protected". By using getAccessToken() from /auth/service.js file, we are going to store the accessToken into the header and call the API movies route. For now, we will view the movies.name and movies.airDate, but we do have a large list to choose from. After the user logs in, they are going to be taken to this view, which has the TvShows component in the view as well. That will allow for the user to see both components at the same time once authenticated. Let’s make our user interface a little prettier! When the user clicks on "Log In" it’ll bring up a popup window without navigating away from the current view. The user will log in with their credentials and the popup will disappear and our Movies component will show. The user will then see a list of movies and tv shows. The Log In button will change to the Log Out button and if we "inspect" the page, go to the "Network" tab, click on "movies" and in the "Headers" portion, we can scroll down and see that the accessToken is begin stored. If the user clicked on "Log Out", that would take them to the unauthorized view of just the "TV Shows" and the session will be terminated. The popup method for logging in is handy because it does not redirect the user away from their current screen. The downside to it is a lot of users block popup's, so it may not be the best choice for authentication. In our project, we were able to implement the popup method and use the new React Hooks. Depending on your project, popup could be the way you go.